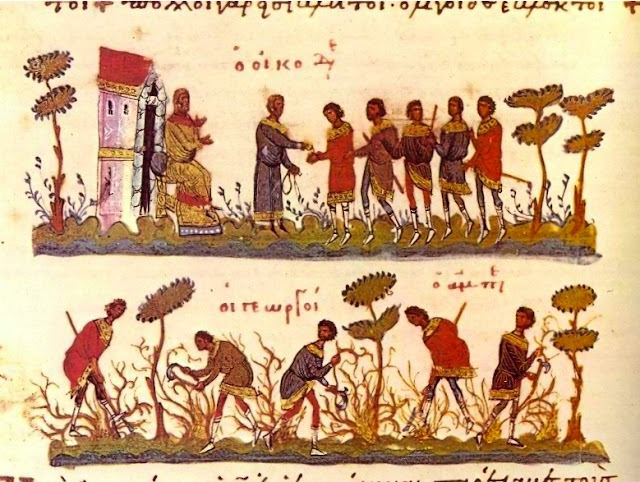 The parable of the laborers in the vineyard (Matt 20.1–16) closes with a repetition of the statement that immediately precedes it and to which it is logically connected (note γάρ in 20.1): “the last shall be first and the first shall be last.” Although some see a poor fit between this proverbial statement and the parable, it actually connects very closely at two points. Not sure what the source of this is. The response is well known and despite much debate about the parable’s meaning, it does seem to be about the problem of envy or “the evil eye” (ὁ ὀφθαλμός πονηρός) among Jesus’ disciples. This was part of the problem Peter showcased in the preceding paragraph. In this, the concluding proverbial statement works as a rebuke to Peter both in its first instance in 19.30 and then again in 20.16 at the end of the parable. The statement works as an inclusio for the parable. The point is that Jesus’ disciples should not begrudge God his generosity; instead they should be grateful when he treats people in ways that can only seem wrong when fairness has been wrapped around ourselves. After all, isn’t God free to do as he wishes with what is his? If so, then he is free to treat those we deem last the same way he treats those we deem first. Although it is possible that the words πολλοὶ … ἐκλετοί had been accidentally omitted from an ancestor of א B L Z 085 al owing to homoeoteleuton, the Committee regarded it as much more likely that they were added here by copyists who recollected the close of another parable (22:14, where there is no significant variation of reading). The problem is that the statement “many are called but few are chosen” makes good sense in Matt 22.14 after a man is thrown out from a wedding feast without proper dress. But here in Matt 20, there is no hint of some people being excluded or not chosen (presumably, all the workers take what is theirs and go). Instead, all receive the same pay just as all were chosen to work in the first place. Exclusion is not really the point here. Nor is there an obvious reason to harmonize the text here as there is in Luke 14.24 where we also find the saying added by a few manuscripts. There, harmonization is the obvious explanation since that is Luke’s banquet parable. But Matt 20 has little in common with those two passages except for the general reversal of expectations which is found in much of Jesus’ teaching. There is a verbal connection in the use of the word “many” (πολλοί), but even that is only found in Matt 19.30 not here in 20.16. So I find it a bit odd for Westcott and Hort to say that the longer reading comes from “the close of a similar parable” (Appendix, 15; so too Willker). Both readings have early support: in C D syr for the longer and א and B for the shorter. Given the apparent awkwardness of the longer reading in Matt 20.16 it is, in my opinion, the more difficult reading. As for transcriptional evidence, the lack of a good parallel context weighs against harmonization. On the other side, the -οι endings make homoeoteleuton, as Metzger recognized, the obvious cause for the shorter reading. If external evidence is not against the longer reading and the internal is for it, then it should be preferred. But what do others think about this one? Is there a good explanation for Matt 22.14 being brought into Matt 20.16 that I’ve missed? If the longer reading is original, how does it fit in the context? What does it add to the meaning? The John Rylands Library is running an exhibit through August 2018 called The Alchemy of Colour. They even have a series of short YouTube videos describing non-invasive ways that multi-spectral analysis can shed new light on manuscripts. The videos are a delight to watch. In the video, Cheryl Porter gives a great description of some of the ways purple was made and the significance the colour had in antiquity. She mentions specifically that purple was often equated with power. That has led some to suspect that purple Gospel books could have had political significance. Rather than a discussion of the colour purple, however, I wanted to use the opportunity afforded by the video to point readers to some of the work being done by Maurizio Aceto. You might ask why Aceto appears in a video about the use of purple in manuscripts, especially because he doesn’t say anything about the colour. The reason is that Aceto has published several articles in recent years on the use of non-invasive scientific testing to learn about ancient artefacts, and purple codices have been subjects of a number of them. In one of his publications (“First Analytical Evidences of Precious Colourants on Mediterranean Illuminated Manuscripts“), he and a team of researchers used Raman spectroscopy, X-ray fluorescence spectrometry (XRF) and UV-Vis diffuse reflectance spectrophotometry with fibre optics (FORS) to identify the inks and colourants in the Vienna Dioscurides and Vienna Genesis manuscripts of the sixth century. I give the information for some of Aceto’s publications below. If you like manuscripts and dabble in science (or vice versa), they are interesting reads. Scientists like Aceto have a whole toolbox of equipment that can be used to study manuscripts that easily goes unnoticed by scholars concerned with the texts those manuscripts contain. Besides, science is fun! Aceto, Maurizio, Angelo Agostino, Gaia Fenoglio, Pietro Baraldi, P. Zannini, C. Hofmann, and E. Gamillscheg. “First Analytical Evidences of Precious Colourants on Mediterranean Illuminated Manuscripts.” Spectrochim. Acta A 95 (September 2012): 235–45. Aceto, Maurizio, Angelo Agostino, Enrico Boccaleri, and Anna Cerutti Garlanda. “The Vercelli Gospels Laid Open: An Investigation into the Inks Used to Write the Oldest Gospels in Latin.” X-Ray Spectrometry 37 (2008): 286–292. Aceto, Maurizio, Ambra Idone, Angelo Agostino, Gaia Fenoglio, Monica Gulmini, Pietro Baraldi, and Fabrizio Crivello. “Non-Invasive Investigation on a VI Century Purple Codex from Brescia, Italy.” Spectrochim. Acta A 117 (January 3, 2014): 34–41. Aceto, Maurizio, Angelo Agostino, Gaia Fenoglio, Ambra Idone, Fabrizio Crivello, Martina Griesser, Franz Kirchweger, Katharina Uhlir, and Patricia Roger Puyo. 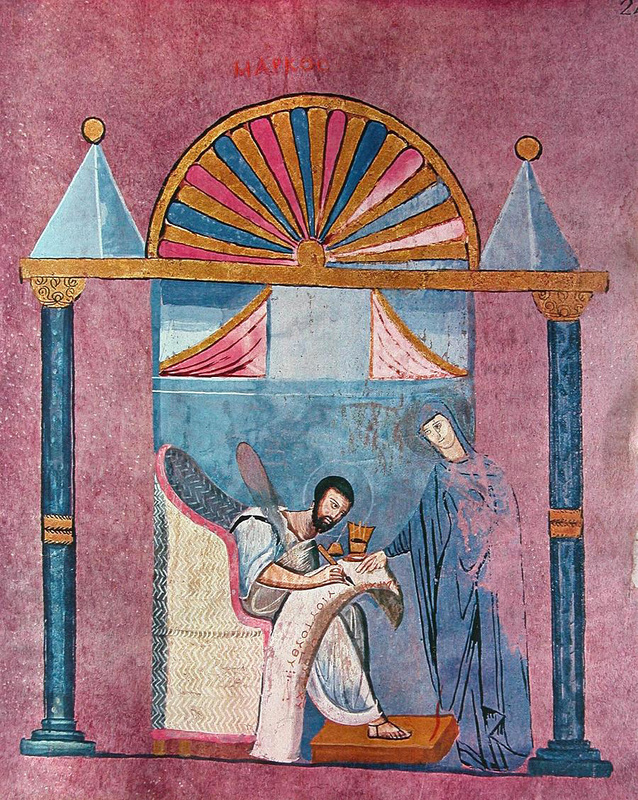 “Analytical Investigations on the Coronation Gospels Manuscript.” Spectrochim. Acta A 171 (January 15, 2017): 213–21. In honor of our newest blog member who is an expert in all manuscripts purple, here is something I noticed last week in class. It’s not uncommon for Gospels manuscripts to feature portraits of the Evangelists writing out the first line or so of their Gospel. Now, look closely at the text Mark is copying in this miniature from Codex Rossanensis/042 (6th cent.). Elijah can tell us more about the dating of the artwork from what is perhaps the earliest illuminated NT manuscript. This is clearly telling us what the original reading is there. We have visual proof! When I first started learning about textual criticism at seminary, textual criticism was not much more than one lecture on Romans 5:1 in intermediate Greek, and if you were lucky, an introductory course that was only taught once every few years. I had to wait a few years for the introductory course. My intermediate Greek professor pointed me to Metzger and Ehrman’s Text of the New Testament. After that, I found this blog and never stopped reading it. It was like drinking from a fire hose at first, but I am deeply thankful for all the posts and comments here over the years that have helped make me who I am. It is an honour to be a contributor to this blog. I recently finished my PhD at the University of Edinburgh under Paul Foster. James Snapp recently interviewed me about this research over at his blog, The Text of the Gospels, but I will give a summary of my research and results here. Like Alan Taylor Farnes, I too decided to test the “singular readings method”. Whereas Farnes did that with Abschriften, I took a closer look at the sixth-century purple codices 022, 023 and 042. Because these three manuscripts were copied from the same exemplar, I reconstructed the text of their exemplar in Matthew’s Gospel where that was possible. In nuce, singular readings hypothetically could be from anyone, but they’re probably the work of the actual person who made the manuscript. If anything, singular readings tell us about the activity of the person who made the manuscript with some contamination from previous scribes in the line of transmission back to the archetype. By focusing on singular readings, one could include inherited readings from the exemplar and exclude non-singular readings created by the scribe. Those possibilities allow errors on both sides of the data. I set out to test the method in a three-tiered approach. First, I went to all the places in Matthew where 022, 023 and 042 are all extant and compared orthography (ει/ι and αι/ε interchanges), unit delimitation, kephalaia and titloi, the Eusebian apparatus and textual changes. This comparison allowed me to build a preliminary profile of each scribe to help resolve issues reconstructing the exemplar later one where only two of the three manuscripts were extant. For example, the scribe of 023 is incredible and makes very few changes, but the scribe of 042 has a noticeable tendency to harmonise Matthew to Markan parallels. Therefore, if only 023 and 042 are extant—and they differ—, and one of the possibilities is that 023 preserves the text of the exemplar and 042 harmonises to Mark, then that is probably what happened (as opposed to 042 preserving the text of the exemplar and 023 making the change). Second, I analysed the singular and family readings of each manuscript (readings unique to these three manuscripts). I did this to include “inherited singulars”. Of course, the inherited readings aren’t singular in my cases, but that is only because we have more than one copy of the exemplar. Stated alternatively for 022, I studied the singular readings of 022 as we would count them if 023 and 042 never existed. This modification best replicates the situation for any other early manuscript, like the early papyri studied by Royse. Third, I reconstructed the 022-023-042 exemplar, analysed the changes each scribe made to the text and compared these numbers with what I got from the modified singular readings method. The results? An analysis of singular (and family) readings of 022, 023 and 042 does not give accurate conclusions about the scribes who made them. In fact, if you add up the total number of singular and family readings from the three manuscripts, about two-thirds of them are inherited readings, not scribal creations. If you add up the total number of scribal changes in all three manuscripts, about two-thirds of them are non-singular. Instead of getting the habits of the actual scribe with a bit of contamination from the complex scribe, with the purple codices, the unique readings tell us more about the “habits” of the complex scribe with a bit of contamination from the person who actually wrote the words. I wonder if even that is accurate because of how many non-singular scribal changes went unnoticed. Even though the method doesn’t “work” with 022, 023 and 042, it still might tell us something about scribal habits in the early manuscripts. Several of the changes I saw were instances in which scribes aligned the text to what would become the majority reading, and I don’t think that would be the case for the early papyri—certainly not as much. I’m not saying to throw the method out. It still tells us how manuscripts are unique, even if in these three instances it fails to tell us about scribes. In the end, the project was a lot of fun. I learned a lot about three sixth-century witnesses to Matthew’s Gospel and their scribes. The manuscripts themselves are gorgeous—they were a good choice of manuscripts to spend 3.5 years looking at. I also highly recommend Byzantine manuscripts to people looking for thesis topics. Even though I am not a Byzantine prioritist myself (though I have the highest respect for our Silver-Haired Assassin), it is exciting to notice new things by working with manuscripts that have been largely neglected since their discovery and initial publication. This is the last of a series of blog post  on some of the textual variants found in the Passion narratives. The series discusses the rationale behind the text adopted in the Greek New Testament as Produced at Tyndale House in (1) Mt 27:16,17, (2) Mt 27:49, (3) Mk 14:30, 49, 72a, 72b, (4) Lk 22:31, (5) Lk 22:43-44, (6) Lk 23:34.
ὁ δὲ Ἰησοῦς ἔλεγεν· πάτερ, ἄφες αὐτοῖς· οὐ γὰρ οἴδασιν τί ποιοῦσιν. A second similarity is the nature of the longer reading. Neither in 23:43a or in 22:43-44 is there a clear source of influence. Yet there are plenty of thematic links with the Lukan corpus. Stephen’s words in Acts 7:60 (κύριε, μὴ στήσῃς αὐτοῖς ταύτην τὴν ἁμαρτίαν ‘Lord, do not hold this sin against them’) convey a similar sentiment as 23:34a but the wording is quite different. 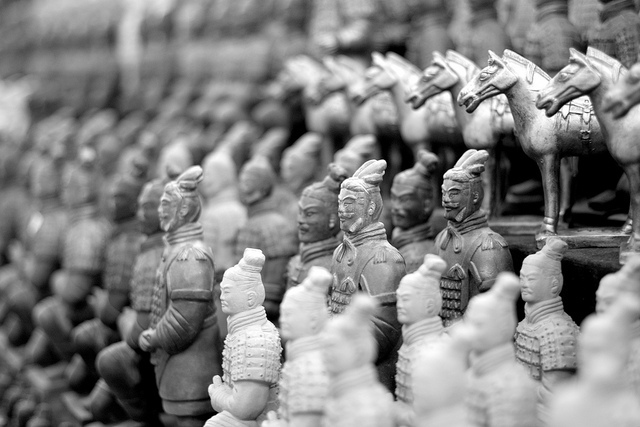 We have a shared theme rather than a source of harmonisation. The same is true for the shared notion of ‘not knowing what they are doing’ in 23:34a and Acts 3:17 (κατὰ ἄγνοιαν πράξατε ‘you acted in ignorance’). One could even argue that Acts 3:17 presupposes something like Luke 23:34a. Yet again, it seems unlikely that Acts 3:17 provided the wording that we find in our passage. The main argument against the originality of 23:34a is that it is left out in a part of the earliest evidence. If these words were original, there does not seem to be a good motivation for leaving it out. A reconstructed background is that the words in question may be an agraphon (Metzger’s Commentary) which is subsequently made part of the gospel-tradition for numerological reasons as it brings the number of sayings on the cross up to seven (Whitlark and Parsons). The shorter text can be explained as a harmonization, this time by omission. And there are parallels elsewhere in the early manuscripts, and especially so in the Passion narratives. We have seen harmonization in the early witnesses in Matthew 27:49, and harmonization by omission in the variants in Mark 14, and I believe also in the two earlier discussed variants in Luke 22. And for those who accept the reading ‘Jesus Barabbas’ in Matthew 27:16, 17 (which I don’t) there is another example of harmonization by omission. Thematically and theologically it fits the Lukan writings. Metzger in his Textual Commentary mentions the destruction of Jerusalem as an event that seems in contradiction to Jesus’ prayer for forgiveness. One could go one step further and suggest that the omission is an anti-Jewish variant (in the sense that they should not be forgiven). However, as with many attempts to find a social or theological background to a textual variant, such reconstruction is rather speculative and perhaps more indicative of our desire to have a story behind a textual variant than that it provides us with a real argument. Admittedly, anti-judaism is not a strange sentiment in early Christianity (see Eubank who unpacks this line of argument). Southeastern Seminary has a series of Library Talks, which apparently take different forms. 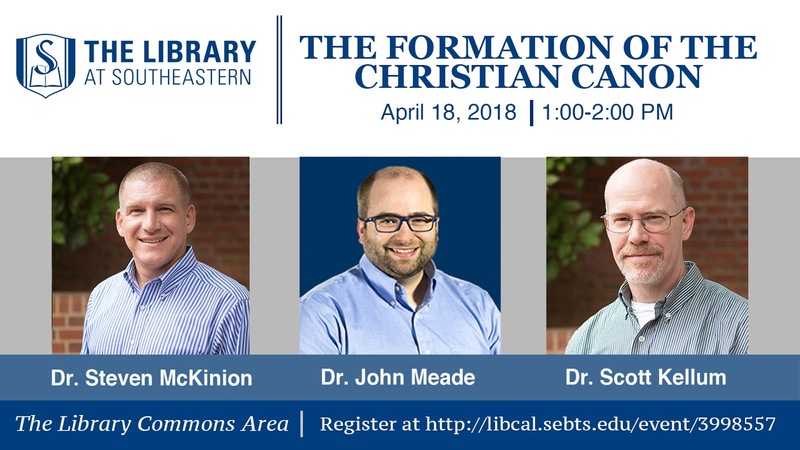 For this ‘Library Talk’, they asked me to be part of a panel with two of their faculty members, Steve McKinion and Scott Kellum, to discuss the formation of the Christian Canon. The event is free and open to the public. I’m told seating is limited, so register today. If you can't attend the event, it will be recorded, and the video will be posted about two weeks after the event. Ian Nelson Mills (can you see me?). 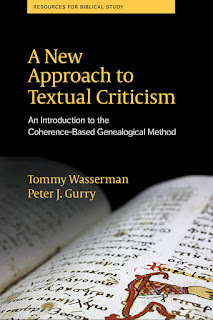 Another new book on New Testament textual criticism is in the making: Liturgy and the Living Text of the New Testament: Papers from the Tenth Birmingham Colloquium on the Textual Criticism of the New Testament edited by H. A. G. Houghton, Text and Studies 3.16 (Piscataway, NJ: Gorgias Press, 2018). The textual history of the New Testament is a dynamic tradition, reflecting differing readings, interpretations and uses of its canonical writings. Twenty years after the publication of D.C. Parker’s celebrated volume The Living Text of the Gospels, the papers in this collection provide further insight into the lives of the New Testament text. One especially important focus for the New Testament as “living text” is its use in Christian worship: individual chapters examine the importance of liturgical manuscripts in Coptic and Greek traditions, alongside consideration of broader themes related to the lectionary text. Several famous biblical passages are the subject of extended treatment, including the Pericope de Adultera, Jesus’ teaching on the Temple in Mark, and the Lukan genealogy. 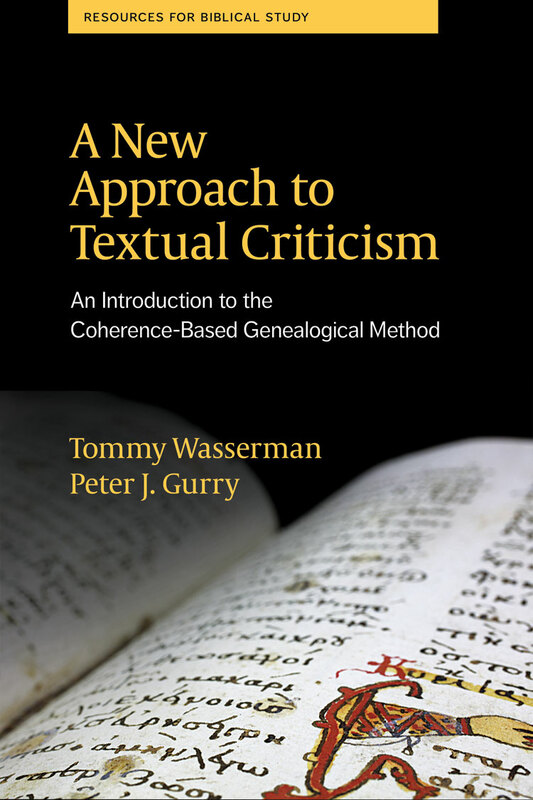 The contributions represent original research by an international range of scholars, first presented at the Tenth Birmingham Colloquium on the Textual Criticism of the New Testament. I am very pleased to have received proofs a few days ago of my chapter which will open the volume, “Was There and Alexandrian Recension of the Living Text of the Gospels?,” in which I interact with Parker’s Living Text as well as the question of an Alexandrian textual recension, an issue that has received some attention after Brent Nongbri’s recent redating of Papyrus 75. Here you can read all about the wonderful colloquium organized by Hugh Houghton who is also the editor of the volume. 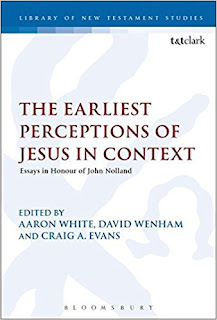 Below is the editors’ overview of the new Festschrift for John Nolland: The Earliest Perceptions of Jesus in Context: Essays in Honour of John Nolland. Thanks to Aaron White for providing it. These essays have been written by a number of friends, colleagues and students, to mark John Nolland’s 70th birthday and to express, on our own behalf and on behalf of many others, our appreciation of John and of his work. They were presented to John Nolland at a meeting of the Tyndale Fellowship for Biblical and Theological Research in Cambridge in July 2017. The essays range widely over John’s own range of interests. Some essays are very much related to the context of Jesus and of the Gospels: Rainer Riesner’s discussion of the latest archaeological and historical evidence surrounding Nazareth falls very clearly into this category. Craig Evans describes the importance of Livia Julia August, the second wife of the emperor Augustus, not least in the estimation of Philip the tetrarch, and suggests that Philip’s controversial plan to build a temple to Julia in Bethsaida may be the context of Jesus’ famous promise to Peter ‘On this rock I will build my church’. The Gospels themselves are obviously among the earliest perceptions of Jesus to which we have access, and Armin Baum considers the much debated question of the genre of the gospels, concluding that they are closest generically to Old Testament and Jewish narratology, though with slight influence from Graeco-Roman biography. Thomas Hatina writes of the importance of Social Memory perspectives for an appreciation of the gospels, considering particularly Jesus’ quotations of Scripture and relating these to the culture and context of the evangelists. Most of our essays are studies of the perception of Jesus within the New Testament. 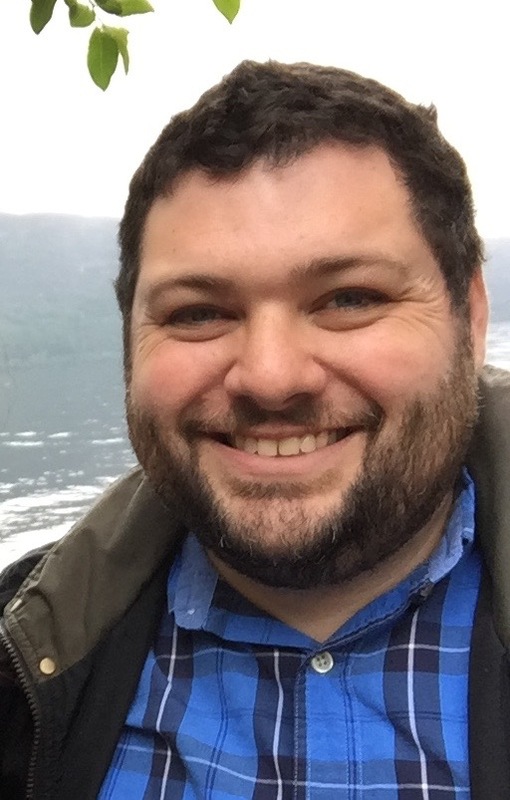 Tom Wright argues that Psalm 8 is a key Christological text in the gospels, and in a wide ranging article explores the text in relation to a range of themes from Adam to Davidic Messianism to the Son of man, to priesthood and temple, concluding with reflection on the coming of Yahweh and the divine identity of Jesus. 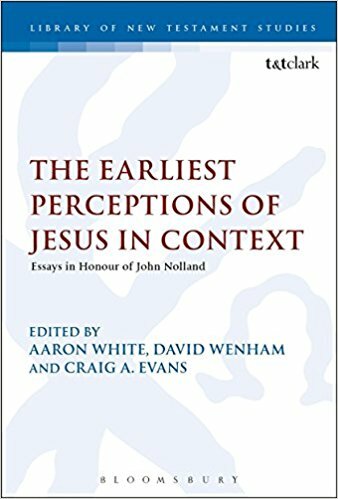 Others focus on particular gospels, notably on Luke-Acts and on Matthew, as is appropriate in a volume dedicated to John Nolland. Darrell Bock explores one particular part of Luke’s Central Section, namely 11:24–13:9, pointing out the themes of authority and accountability running through those verses. Robert Brawley looks at the characterization of the Pharisees in Luke-Acts, finding the Lukan portrayal of their relations with Jesus to be more positive and less confrontational than has often been recognized. Yongbom Lee looks at Jesus as Son of Adam and Son of God in Luke-Acts, identifying places where Adamic Christology is important to Luke. Steve Walton focuses on the Ascension theme in Acts, showing its importance with significant implications for the divine identity of Jesus. Christoph Stenschke looks at the missionary speeches of Acts, and notices how Luke, for all his interest in the Gentile world, brings out the Jewish context of Jesus. Daniel Gurtner takes in both Luke and Matthew, examining the theme of the temple in both gospels, finding a rather positive view. Douglas O’Donnell looks just at Matthew, examining the vocative kyrie as it is used in addressing Jesus, and concludes that it has divine resonances and it is not just respectful address. Roland Deines offers a rather comprehensive and insightful discussion of the generally neglected subject of the Holy Spirit in Matthew. David Wenham supports those who see the Matthean beatitudes as having a very coherent almost poetic shape, related to its Matthean context. Of course, the rest of the New Testament apart from the gospels and Acts gives us insight into the earliest perceptions of Jesus. Craig Smith explores the theme of rest, sabbatismos, in Hebrews and relates it to Matthew 11:28–12:14. 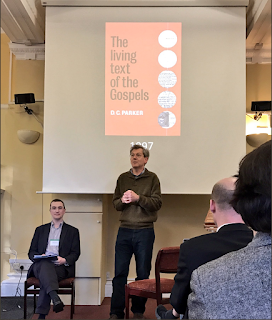 Peter Davids looks at James and 1 Peter, noting many echoes of the traditions of Jesus in both letters, but explaining how their use of the traditions reflects their particular contexts. John Nolland’s interests range much more widely than just the gospels, and indeed than the New Testament. He has been involved for many years in ministerial training, and it is good to have an article by former colleague Dr Eeva John on ministerial training, relating it to Luke’s portrayal of Jesus as teacher. It is also appropriate to have Eduard Schnabel’s article on Romans 12:1, the point in Romans where Paul moves from doctrine into ethics; the article explores the meaning of worship that is logikē. Schnabel recognizes the strength of the traditional translations ‘reasonable’ or ‘spiritual’, but prefers to look towards the ‘word’ sense of logos, suggesting that Paul is exhorting the Romans to offer their bodies as a living sacrifice that speaks and communicates with the world. This is an appropriate conclusion to our volume of essays both because John Nolland has done so much to help students to engage with detailed and responsible study of the Greek text (especially in his class on ‘Advanced Greek’ on 2 Corinthians), and because his interests have included both a concern for mission – for communication – but also for Christian life and ethics. In bringing these essays together we honour John as someone who has’ investigated things accurately’, so that we may ‘know the reliability of the things we have been taught’ (Lk. 1:3–4), and as a teacher, ‘discipled for the kingdom of heaven, who is like a man bringing out of his treasure things old and new’ (Matt 13:52). He is also a humble and self-effacing Christian scholar who would want to say ‘we do not proclaim ourselves, but Christ Jesus as Lord, and ourselves as your servants for Jesus’ sake.’ (2 Cor 4:5). We are grateful for all his service to us and to many others. As editors we are grateful to Bloomsbury T&T Clark for their willingness to publish these essays and for all their help in doing so. Congrats to Miguel M. who won our latest ETC blog giveaway. His copy of A New Approach to Textual Criticism is in the mail. For those that didn’t win, Amazon now has the paperback for just $13.28 $15.94 which is 33% 20% off. With free shipping, that’s cheaper than Tommy and I can get it with our author discount! Very good used copies can be had for even less. John Meade, who is currently gallivanting around North Carolina, alerted me to an article over at aeon which is relevant to this blog. It is about the different conception of “original” and “copy” in China. I’m not sure what I think honestly, but I’ve ordered the author’s book out of curiosity and maybe that will help. We had three friends over when I read your email so I asked them. They immediately described the first concept, Fangzhipin, and then had a hard time describing the second, fuzhipin, especially in a way that answered the question of “do you see it as the same as the original?” I’d probably want to ask a few more people but my feeling from them was that the description [above] is accurate. 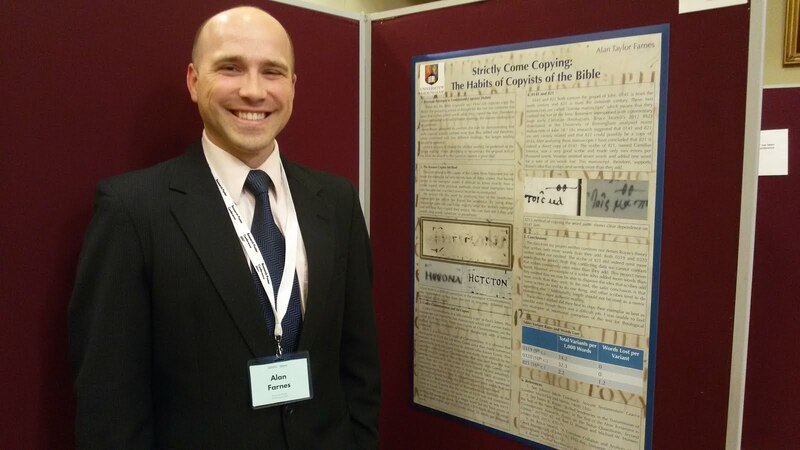 We are delighted to feature the newly baked Dr. Alan Taylor Farnes in this guest blogpost where he summarizes his work on scribal habits in copies where the exemplar is preserved. Well done Dr. Farnes! As many of you may know, I have recently completed my dissertation at the University of Birmingham. The following is a summary with some conclusions, ramifications, and next steps to take. My research has attempted to support or disprove Royse’s new text critical canon that, in fact, the longer reading is preferred. Rather than analyzing early papyri for which no exemplar remains, I chose to identify and analyze manuscripts which have a known exemplar. I have therefore identified twenty-two New Testament manuscripts which have known extant exemplars (see Table here). Of these twenty-two I chose four manuscripts, which are italicized in the Table, and their copies to transcribe, collate, and analyze to determine how well the scribes copied the text of their exemplar. 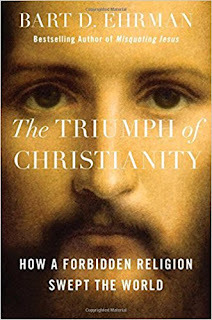 Over at the Gospel Coalition, Mike Kruger has a review of Bart Ehrman’s latest book. It’s another popular volume, this one on why Christianity spread so quickly, a topic Kruger and his Doktorvater have recently published on as well. The surprising thing here? Kruger likes the book and says it’s an important resource. Ehrman has written an intriguing, helpful, and well-balanced volume exploring the development, and eventual dominance, of early Christianity. Certainly there are areas were I, and others, would disagree—for example, on the treatment of miracles, analysis of martyrdom, and the role of tolerance and intolerance. But this volume is a refreshing shift away from the tone of some of Ehrman’s earlier volumes that seemed more polemical and critical in their assessment of early Christianity. Indeed, as a whole this is an enjoyable read that is clear, insightful, and well-written. Thus, Ehrman’s volume will be an important addition to any reading list exploring the emergence of Christianity in the first four centuries. The Sweat like Drops of Blood and the Angel in Luke 22:43–44. An early addition? ὤφθη δὲ αὐτῷ ἄγγελος ἀπ᾽ οὐρανοῦ ἐνισχύων αὐτόν. καὶ γενόμενος ἐν ἀγωνίᾳ ἐκτενέστερον προσηύχετο. ἐγένετο δὲ ὁ ἱδρὼς αὐτοῦ ὡσεὶ θρόμβοι αἵματος καταβαίνοντες ἐπὶ τὴν γῆν. It is difficult not to think of Jn 5:3-4, where we have an explanatory comment added to the text concerning another angel, who disturbs the water so that the first ill person to reach it is healed. Though the similarity between our variant unit and that in John are clear (roughly similar length, involves an angel), there are also differences. In John the expansion fills a perceived gap in the story, but here in Luke the variant interrupts rather than explains the flow of the narrative. Mt 27:49, addition of piercing the side of Jesus, taken from Jn 19:34 – dealt with in a previous blog post. The cautionary tale of this variant is that even though the two oldest manuscript have the text (and some good additional support), one cannot automatically follow the rule that the oldest attested reading is therefore the best. Lk 23:17 (explanation that Pilate had to release a prisoner) – again an explanatory gloss. Lk 23:34a the words ‘And Jesus said, Father forgive them for they do not know what they are doing’. Omitted by quite a few of the same manuscripts as omit the text here. Adding details – Embellishment of an existing narrative. If these words were part of the common, popular memory of the Passion narrative, they were bound to find their way into the biblical text. They interrupt the flow of the narrative, there is no need for this heightening description of Jesus’ agony. Both the appearance of an angel and the sweat like drops of blood have a folklore feel about them and are unnecessary supernatural expansions. Better too much than too little. In cases of doubt, leave the words in. Ehrman and Plunkett: These words were added as an anti-docetic improvement of the text. There is no obvious explanation for their origin other than that they are part of the original composition. Luke has an angel motif throughout his writings. From the announcement of Jesus’ birth, all the way through Acts, finishing with an angel encouraging Paul before the shipwreck. Thematically this passage fits Luke. As learned above, this could be a case of bringing Luke’s account into line by omitting an unknown episode (harmonization by omission). 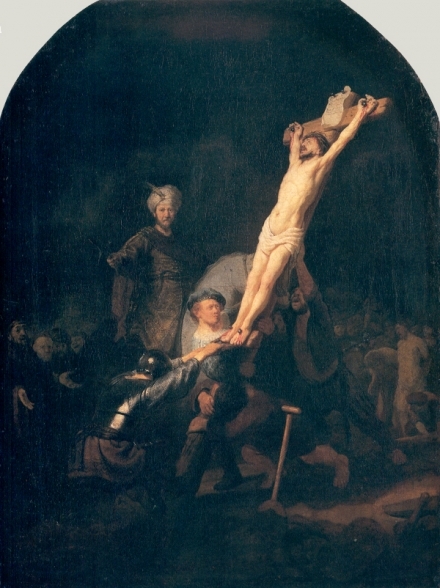 The words are original, but were omitted because of theological embarrassment – Jesus is portrayed as too weak (a crude summary of Blumell’s argument). The words are original, but were omitted because of an anti-Gnostic improvement of the text (Clivaz). I received this notice, which should be of wide interest. We are delighted to announce the advertisement of three postdoctoral fellowships at ITSEE (the Institute for Textual Scholarship and Electronic Editing at the University of Birmingham). All involve work on Greek New Testament commentary manuscripts, to start this autumn. 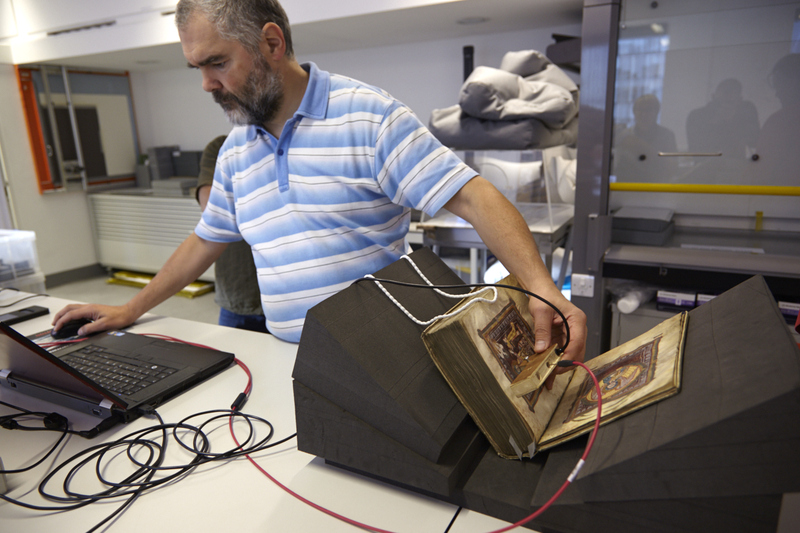 One is on the AHRC-funded Codex Zacynthius project, using multispectral imaging to recover the text of the earliest catena on Luke. Two are on the ERC-funded CATENA project, producing a catalogue of commentary manuscripts, identifying different stages in their history and development and making electronic transcriptions and editions of their text. The posts would be suitable for Classicists or scholars of the New Testament and early Christianity with experience of working with Greek manuscripts. Candidates may apply for one or more of these positions. The deadline is 11th April 2018. Closing date 9th April 2018. Please forward this message to anyone who might be interested in applying. In this post, I give a few examples wherein Theodotion, Aquila, or Symmachus reflect a different vocalization of the consonantal text than what the later Masoretes recorded as the traditional reading. 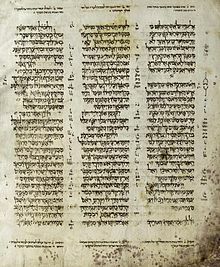 The issue is this: how closely do the Three (1–2 century Jewish revisers of the Greek Jewish Scriptures) mirror the Masoretic Text (9–10 century)? Of course, the general answer is that they followed the proto-MT closely, but that is different than saying they agree with the MT perfectly. As a caveat, textual criticism focuses on the differences between texts (which is what I'm about to do), but let's not let these relative few, but important differences, distort our view of the overwhelming agreement between MT and the Three. It's difficult to overstate the Three's close agreement with MT, which is why it would be easy to gloss over places where they disagree. My examples come from Job and Isaiah, and they could be multiplied. Comment: The Old Greek read אכזב as a verb similar to later MT, while Th and Aq read it as אַכְזָב, an adjectival/nominal "false" or "falsehood." They read the same consonants with different vocalizations. As an aside, HALOT's entry of אַכְזָב probably could have cited the readings of Theodotion and Aquila here in support of this rarely attested Hebrew lexeme (cf. HALOT 1:45). From a multitude those oppressors/those being oppressed will cry out. Comment: There is no Old Greek for this verse, the Greek line in our MSS coming from Theodotion. Sym agrees with the vocalization of MT, “oppressions” (cp. Ecclesiastes 4:1), while Th read עָשׁוֹקִים “oppressors” or עֲשׁוּקִים “the oppressed” (the latter option may equal the vocalization of MT but indicates a different derivative, the pl. pass. ptc.). In any case, Theodotion and MT attest to the same consonantal text but different vocalizations or understandings of those consonants. Or, if we want to read MT as the pass. ptc., then Symmachus has the different reading or understanding. Comment: Symmachus agrees with MT in his reading of נשים "women." But Theodotion and Aquila read נשים as נֹשִים "creditors" from I נשׁא/II נשׁה “to lend” (the analogous formation of III-ה and III-א verbs). Therefore, this is another example of some of the Jewish revisers agreeing with the Old Greek's reading of the consonantal text where the Masoretes preserved a different vocalization, still an ancient reading as Symmachus confirms. Because of the transgression of my people, the strike was to them. Because of the lawless deeds of my people, he was led to death. Because of the faithlessness of my people, he struck them. On account of my people's unrighteousness, the strike was to them. Comment: The purpose of this example is not to engage the textual issue between the OG and MT (as fun and interesting as that one is). More modestly, today, I want to point readers to the fact that MT vocalized נגע as a noun (cp. Symmachus), while Theodotion and Aquila rendered the same consonants as a verb (cp. Jerome's Vulgate: percussit eos/eum). There are some large-scale differences between the readings of Theodotion and proto-MT (e.g. parts of Theodotion Daniel and the longer ending of Theodotion Job). But most readings of the Three are of the kind surveyed in this post. These readings, preserved for us in Origen's Hexapla and its subsequent Christian reception, give evidence for the history of the Hebrew Bible and also for Jewish exegetical approaches to their texts around the turn of the era and into the Rabbinic period. They provide a link between the texts of the Dead Sea Scrolls and the Old Greek on the one hand and the later Medieval Hebrew MSS on the other. Thus we would do well to pay attention to them. It’s time for another ETC blog giveaway! This time we’re giving away mine and Tommy’s recent book on the CBGM. Enter to win below. Update: Congrats to Miguel M! Faithlife, producers of Logos Bible Software, have a new film (what don’t these people do??) coming out about New Testament manuscripts. It looks apologetic-y and is hosted by Craig Evans. Below is the description and the promo video. You may see some familiar faces. I don’t know what “groundbreaking new evidence” there will be, but the production quality here seems great. The manuscripts sure do look cool in the trailer. Εἶπεν δὲ ὁ κύριος· Σίμων Σίμων, ἰδοὺ ὁ σατανᾶς ἐξῃτήσατο ὑμᾶς τοῦ σεινιάσαι ὡς τὸν σῖτον. Are the word εἶπεν δὲ ὁ κύριος part of the text or not? And to me this is quite a thorny problem that I haven’t been able to resolve yet. Its impact on the text is not big, but if the text adopted in the THGNT is correct, we may have a pattern in a group of early manuscripts that is relevant for the two big variants later in Luke’s passion narrative. The abrupt change of addressee called for a marker to signal this change, the variant supplied this. A new kephalaion starts at 22:31 and expansions such as ‘and the Lord said’ occur frequently at these breaks, especially at the start of a lectionary. In light of the synoptic parallels it seems that the whole of Jesus’ speech comes from two occasions, and therefore the variant is introduced to separate these out. The reference to Jesus as κυριος betrays it secondary origin; it is the language of the introduction to lections more than how the evangelists describe Jesus in narrative. The introduction to Jesus’ direct speech is superfluous, he is already speaking, and therefore the words provide an unnecessary disturbance which led to their removal. Though it is true that the start of a kephalaion is a strong argument against originality of the longer reading, ℵ-01 has it, and there is no indication that the kephalaia were already part of the textual tradition in the fourth century. The reference to Jesus as κυριος within authorial narrative (so, not in quoted speech) is found elsewhere in Luke: 7:13; 10:1, 41; 11:39; 13:15 etc. For me this is a real tricky variant. If someone could demonstrate to me that kephalaia were around by the time ℵ-01 was produced and could have influenced its text, the case for switching around the text and variant gets stronger. As things stand now, I would not put it past the P75 B-03 cluster to give us a text that is a bit too clean, and therefore the Tyndale House Edition prints the words in the main text, though the variant has the ‘diamond of uncertainty’. Over at the Deutsche Bibelgesellschaft website, there is a German press release about a recent meeting of the new NA/UBS committee. Below is a translation into English. The most important news here is the projected date of completion (2021/22), the expected changes covering Mark and Acts, and the changed order of books. Stuttgart / Washington. The editors for the Greek New Testament and the Novum Testamentum Graece (“Nestle-Aland”) met at the newly opened “Museum of the Bible” (MOTB) in Washington, DC. After the conference, the contours for new editions of the world’s two leading scholarly editions of the Greek New Testament are emerging. The Global Council of the United Bible Societies (UBS) recently recruited the international panel. The editions are being prepared at the Institute for New Testament Textual Research founded by Kurt Aland at the University of Münster under the direction of Prof. Holger Strutwolf. In addition to him, the following scholars have been appointed as editors: Prof. Christos Karakolis (University of Athens), Prof. David Parker (University of Birmingham), Prof. Stephen Pisano (Pontifical Biblical Institute, Rome); David Trobisch (Green Collection, Oklahoma City) and Dr. Klaus Wachtel (University of Münster). This ensures that the experiences and interests of different regions and denominations (Protestant, Catholic and Orthodox) are incorporated. In addition, Dr. Simon Crisp (UBS) and Dr. Florian Voss (German Bible Society) are working with the panel. “The research of the text of the New Testament is at an exciting stage,” reports Florian Voss. As part of a large-scale, international research project in Münster, Birmingham and other cities, the Greek initial text of the entire NT, the so-called Urtext, is newly constituted. As a result, among other things, the Greek text is changing in many places. “This will also affect the interpretation of the text and the translation,” explains the editor for the German Bible Society. New editions are planned for 2021/2022. They will bring changes especially in the Gospel of Mark and Acts. Furthermore, the scholars are considering adapting the order of the New Testament writings to the tradition prevalent in the manuscripts, according to which Acts is immediately followed by the so-called Catholic Letters: the Epistles of James, Peter, John, and Jude. The German Bible Society, in consultation with the United Bible Societies, publishes the most important scholarly editions of the Biblical texts. The editions are the basis of Bible translation and exegesis worldwide. A while ago, Pete Head raised an issue concerning the lack of the positive apparatus for a ‘diamond’ reading at 1 John 2:4. Diamond readings are a well-known convention of the ECM. For those that might not be cognisant of it: in ECM (and now, in the Catholic Epistles in NA28) mark places where the editors couldn’t decide on the initial text between the two most likely variants—hence, at such places the base text is split. The reading appearing on top is actually that of the NA26–7 text, although that doesn’t imply its genealogical priority in any way. This morning, as I read the work of another Peter, I came across a similar problem at 1 Pet 2:12. Here NA28 follows its predecessor in printing εποπτευοντες, which, however, is marked with a diamond, following the ECM. The competing variant is the aorist form εποπτευσαντες, attested in A P Ψ 5 33 81 436 642 1735 2344 Byz Cl. In contrast, when we turn to the NA27 apparatus, the positive apparatus is provided, and we’re told the reading is supported by P72 ℵ B C 69 614 630 945 1241 1505 1739 al syH co. Please, excuse this blatant, self-promoting announcement. I felt compelled to post this one because presentations on Origen’s magnum opus rarely, if ever, occur outside the confines of the academic guild. And I’m sure these venues, if they exist at all, never provide coffee and take place in such a beautiful setting as Southeastern’s library and campus. 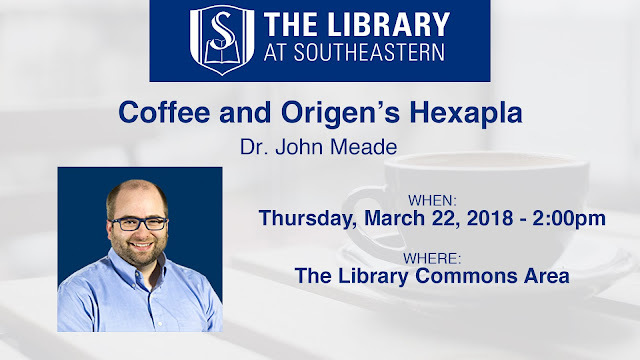 I plan to talk on what the Hexapla was and why it matters to us today and to hang around afterwards for coffee and conversation. If you are in North Carolina’s Triangle area on March 22 at 2:00pm, make your way over to Southeastern’s library. The event is free, and I’m told that seating is limited, so you will need to register here. 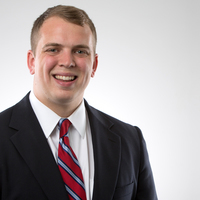 Our latest blog giveaway has now ended and Christopher Atkins at Houston Baptist University has won himself a free copy of John Meade and Ed Gallagher’s Biblical Canon Lists. Congrats, Chris! Thanks to all who entered. For those who didn’t win, you can still get the book for 30% off right now at OUP.com with the code RELIGION18. And watch for more giveaways here on the blog soon. The scene is familiar. The disciple Peter responds vehemently to Jesus’ announcement that all his disciples will fall away (οὐκ ἐγώ). 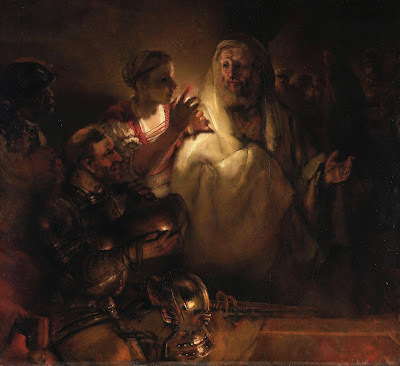 Jesus responds that Peter will deny him three times in the coming night. But three times before what? Matthew has simply ‘before the rooster crows’. Luke says that the rooster will not crow until you have denied me three times. But what does Mark have? The text should read ‘before the rooster crows twice’, but there are a surprising number of variants relating to this number, both in Mk 14:30 and the subsequent unfolding of events.